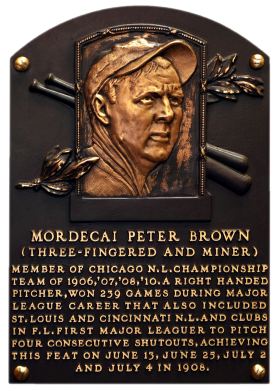 A farm accident in a corn grinder mutilated Brown's right hand, severing most of his index finger, mangling his middle finger, and paralyzing his little finger. The injuries, however, gave his pitches a natural sink and curve. 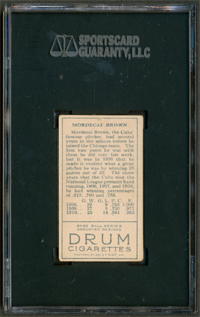 Pitching with the Cubs between 1904 and 1910, Brown's highest ERA was 1.86, helping Chicago to four pennants. 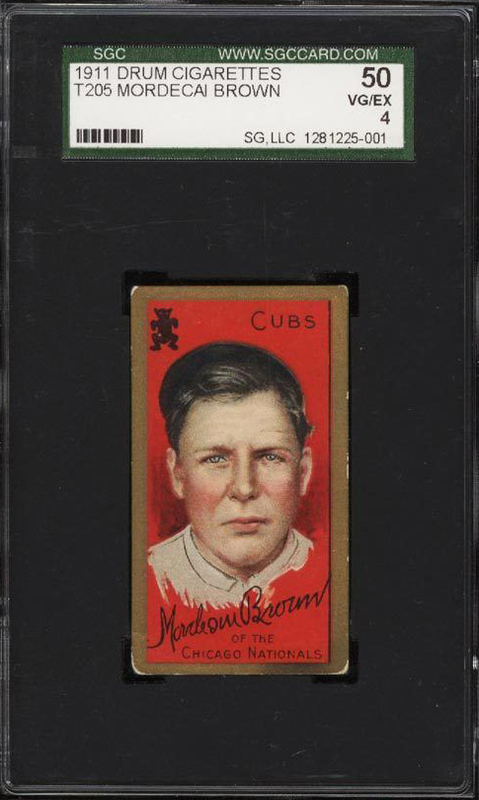 He had a career 239-129 record, with a 2.06 ERA and 57 shutouts. 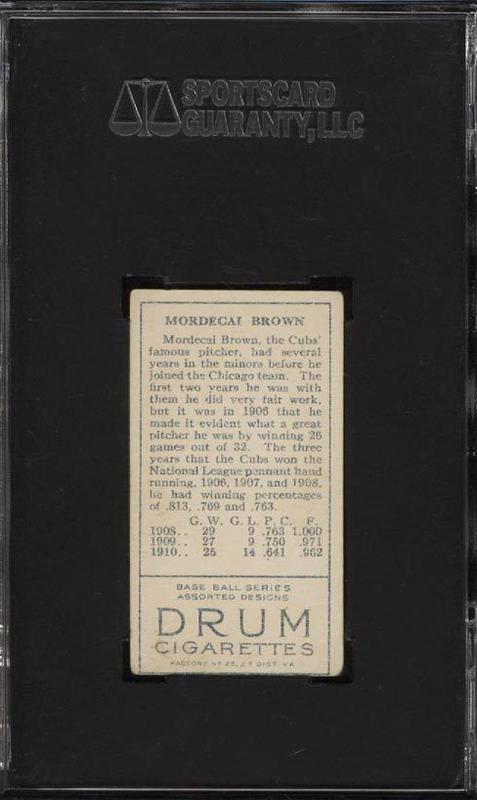 Comments: It's always been T205 for Brown. 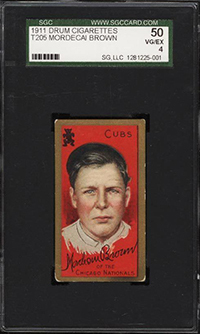 I first purchased a SGC 40 Polar Bear on eBay in October, 2002 from James Verrill (baseballvintage). I sold it a few weeks later for a little profit. 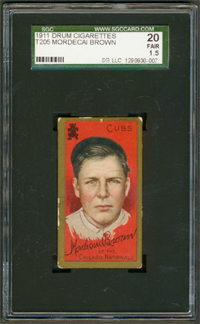 In November, 2002 I purchased a replacement PSA 3 - also on eBay. I upgraded to a PSA 5 (Sovereign Reverse) in April, 2004 with another eBay win from Lisa Fitzpatrick/ mad11240 (in addition to also winning a T205 Chance PSA 5 and T205 Tinker PSA 4 from the same seller). There were two separate occasions when T205 Brown's with Drum backs came up in auction and I placed bids. None of them were successful. 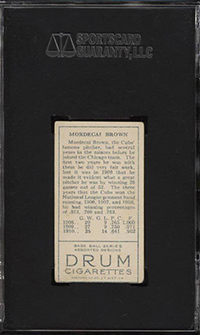 In June, 2013 another Drum back came up, an SGC 20 example, in the Robert Edwards auction and I was able to win the card. I'll sell the Sovereign back and keep my eyes peeled for a Drum upgrade. Looking at it....there's really not much difference compared to my SGC 20 example. I actually prefer the back centering on my card.